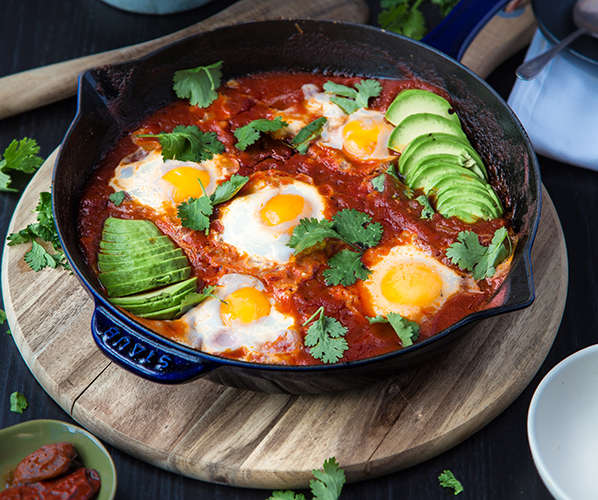 Shakshuka is one of those recipes people hold very close to their heart. Everyone has a different idea of how it’s supposed to be made and they’re not afraid to tell you! In fact, the word shakshuka itself is highly controversial. Depending on where you are in the world, it might be called something entirely different. All I know is that when you cook eggs in a rich and spicy tomato sauce you’re left with one of the most delicious things imaginable. This recipe replaces middle-eastern flavours with southwestern ones and the end result is something truly special. Ronny Joseph is an expert contributor to the HUMANFITPROJECT network for MEN’S FITNESS. Follow Ronny on Instagram (@Primal_Gourmet) and Facebook. For more great recipe ideas delivered right to your mailbox—sign up for the MEN’S FITNESS newsletter. – Heat a large nonstick skillet over medium-low heat. Add in 4 tbsp EVOO. – Add onions and garlic to the oil, season with a pinch of salt and sauté for 10-15 minutes until translucent and soft. Stir occasionally to avoid burning. – Add 1 tsp smoked paprika and toss to coat the onions and garlic. Toast for 1 minute, stirring constantly to prevent burning. – Add in tomatoes, 1 finely chopped chipotle pepper plus 1 tbsp of the sauce it’s packed in and season with a pinch of salt and freshly cracked black pepper. Stir everything together. Set the heat to low and cover the pan with a lid to trap the steam. Continue to cook the tomatoes for 10-15 minutes, stirring occasionally to prevent the bottom of the pan from burning. TIP: if tomatoes begin to dry-out or start to burn, simply add in ¼ cup of water to the sauce. – Once the tomatoes have broken down into a chunky sauce, remove the lid and begin to crack the eggs directly into skillet. 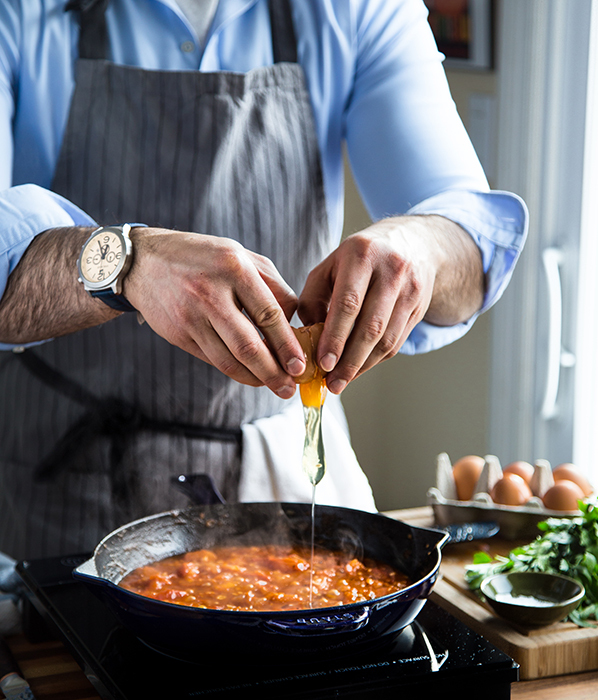 TIP: Using your wooden spoon or spatula, create a small hole in the sauce and crack the egg into the hole you’ve created. This will help the egg to cook into the sauce, rather than over top of it. – Cover with a lid and cook until the whites have firmed-up but the yolks are still runny – approximately 6-8 minutes (Cook slightly longer for more cooked yolks). – Garnish with freshly chopped chilantro and sliced avocado.